Biography "It's the way he sees things!" exclaimed my husband. He hit the nail on the head. It has been evident since Raf was a small child that he had both visual talent and advanced musical abilities (he was composing beautiful, singable rounds when he was five). There's a large painting, proudly framed by his parents and hung on the wall of his childhood home. It shows a row of buildings outlined with whimsy and enthusiasm against a background of vivid primary and secondary colors. The composition and sense of color are extraordinary—not just for a primary school child, but for any artist. Rafael was adopted from El Salvador in 1985 during their civil war. I lived near his adoptive parents; as his aunt, I got to watch him grow up. I shared the doubts and fears of his mom and dad as Raf struggled with the difficulties of maturing and with the frequent blindness of the Public School system to his needs and talents. Raf was a sweet, huggable baby with enormous, round black eyes. He was a brilliant and alarming toddler, a charming and tempestuous child, and a challenging but thoroughly loveable teenager. Raf began taking photographs when he was 6 or 7. As he matured, he sometimes felt isolated. Photography helped him communicate. He was diagnosed with Autism at 26. The diagnosis helped him to make sense of himself and his challenges. He finds that photography can be a way of controlling over-simulation. However, this isn't about Raf's striving to live peaceably amid the dismaying surprises of contemporary life, nor about the obstacles that hindered his progress to adulthood. It's about his remarkable approach to photography. His father first noticed his unusual abilities In April 2013, and referred him to me for guidance. When I began going through his then-recent images, I was blown away. What an eye! Clearly he loved to experiment, to push the capabilities of his point-and-shoot digital camera to their limits, but many of his most stunning shots were dazzlingly simple. In Ray Zor, he photographed a rusty razor blade on a blue-grey gravelly surface, the cutting edge positioned just above the center of the horizontal composition. Many might say: "I could have done that," but most of us would have passed the dingy thing by, never dreaming what a striking icon could be made from this simple discarded object. Rafael presented a "selfie" with his cat Mandalay in Thinking, taken with a point-and-shoot camera with reversible screen. Both subjects wear contemplative expressions, while the angles of the ceiling behind Raf's head echo those of Mandalay's ears in front of him. Paper is one of his most successful still lifes. 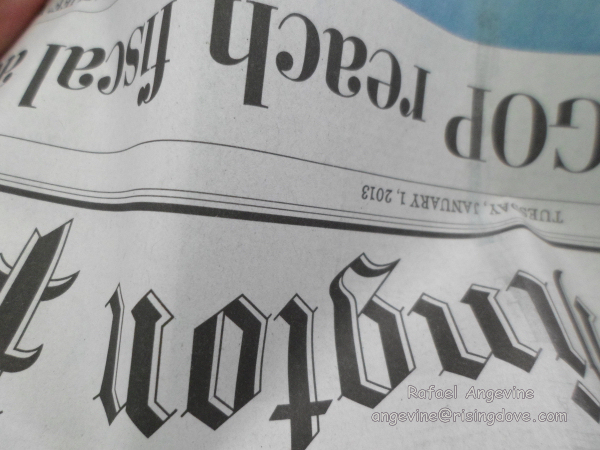 The front section of the paper is shown upside down, artistically folded, the image cropped so that the kinks echo the font letters of the visible part of the masthead. The paper is black and white, but, at upper left of the arrangement, a triangle of orangey forearm skin is revealed, while a softly undulating triangle of blue appears at the upper right corner. Rafael's compelling nature photography will only improve as he gains technical skill to match his outstanding creative impulses. I find him an eager student with plenty of independent motivation. Professional photographer Craig Higgins is also mentoring him. His love for people and pets is tangible in his portraits; the quirkiness of his approach only serves to emphasize his devotion. He especially likes shadows and lines, an affinity that he attributes to his linear mode of thinking. Sunsets, animals and flowers are his favorite subjects because he enjoys the challenge of capturing a changing scene quickly. I think his greatest strength lies in his ability to turn objects of daily life into revelations of his ingenious artistic awareness. The ride may be bumpy, but I definitely want to come along. 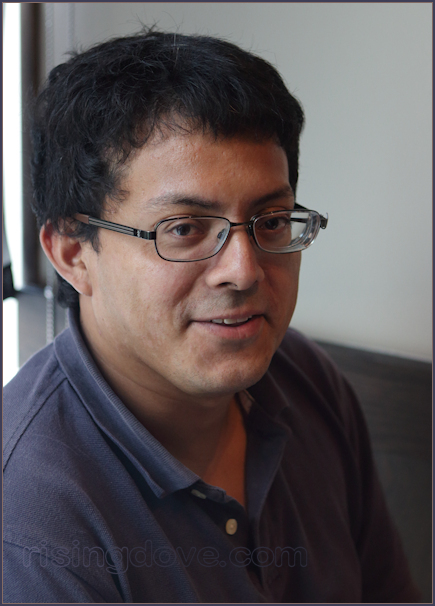 Rafael's work has been shown and sold at the "Through Our Eyes" exhibit of the Madison House Autism Foundation at Johns Hopkins University in Shady Grove, and in an Anacostia Arts Center juried exhibit. He was featured in the Voice of America piece by Jalynn Prince (founder of MHAF) concerning the issues inspiration for their own creations. "I have always been connected to animals more than to people." "Art is a way that I can connect with people that is not destructive to me." "Nothing can stop me from taking photographs because I do it for my own benefit." "I just do it for myself. I don't try to set up a scene or anything. I just take pictures." "I started taking photographs between the ages of five and ten, when I learned how to point the camera at anything." "There are straight lines within each of my photographs."